As I mentioned before, this idea that I had to take the two movies I’ve watched most recently and compare them to each other turned into something bigger. Which was awesome and a lot of fun when I wasn’t married or taking two classes and it wasn’t football season. But here’s something you should know about me. I follow through with my stupid ideas. I have no regard for deadlines, but it will get done, regardless of how few people care about this. Again, the number next to each movie on the left side is their “bug scale” ranking. For simplicity sake, just assume that means it’s their Dustin ranking out of 10. The subsequent numbers are the score of their previous victory. 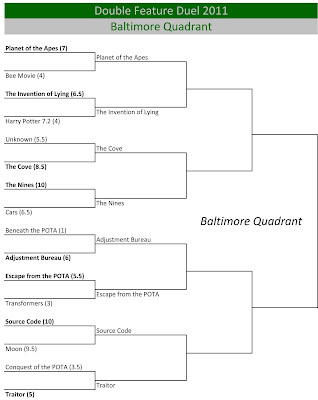 The first 16 have already finished in what I call the “Philadelphia Bracket.” In the No Surprises Here news, Big Fish made it through to the final four. 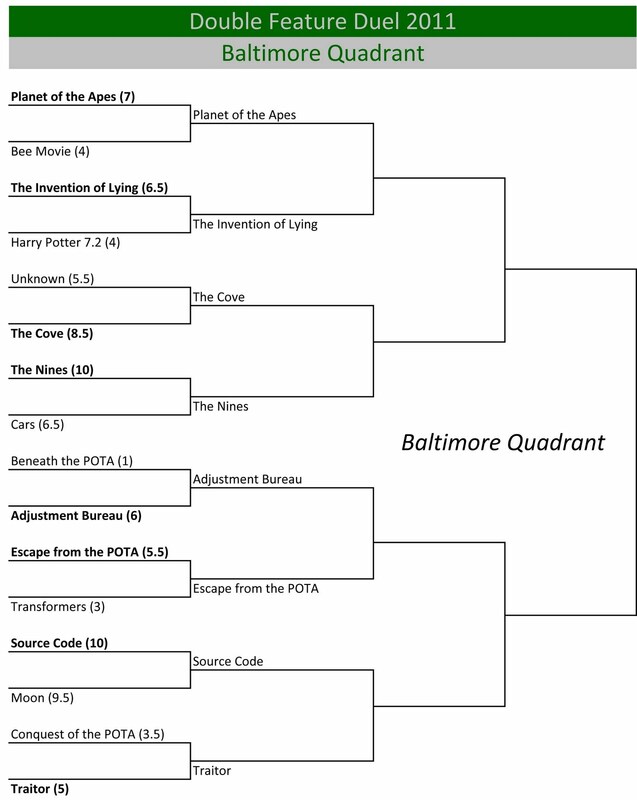 The upcoming “Baltimore Bracket” is infested with Planet of the Apes movies. I decided to try to watch all the original movies before going to see the one in theaters for some reason. Despite the presence in numbers, I’m betting on seeing a 4th round matchup between two 10-bug movies in The Nines and Source Code for a spot in the final four. But that’s not always how it happens. So in the eternal words of Pink, get this party started.